The sycamore is a fast-growing deciduous tree that is hardy to plant in USDA growing zones 5 and higher. 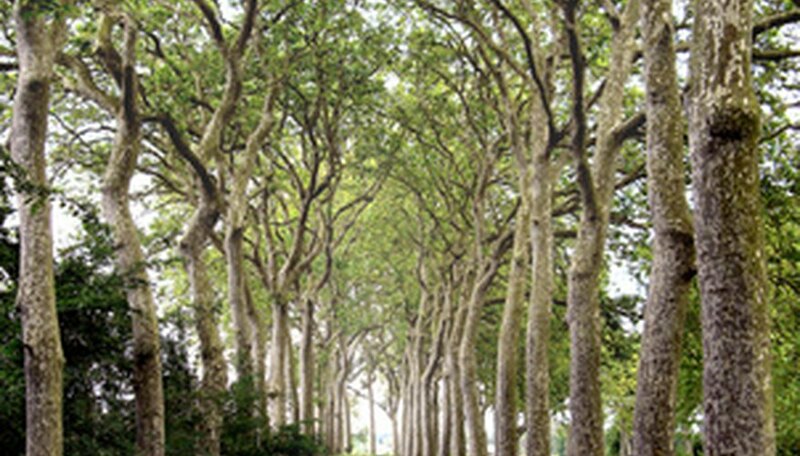 Sycamores grow commercially as a source for timber or in the home landscape to provide shade. Propagate the sycamore tree by taking softwood cuttings in the summer months of June and July and placing them in an environment for root development. Use caution when working with softwood cuttings; they are fragile and lose moisture quickly. Take a 6- to 8-inch softwood cutting from a sycamore tree that has at least two to three pairs of leaves with one pair of buds on the bottom half of the stem. A softwood sycamore cutting is immature stem growth on the end or upper portion of the branches that snaps when bent in half. Fill a clean root propagation tray with one-third sterile peat moss, one-third course sand and one-third perlite. Moisten the rooting mixture with water so it is damp but not sopping. Remove all leaves from the bottom half of the sycamore stem, making sure to retain any bud growth. Dip the bottom end of the sycamore stem into rooting hormone to stimulate root production. Stick the leafless section of the stem into the propagation tray. Mist the cuttings with a water mister and cover the propagation tray with a clear bag to mimic a greenhouse environment. Set the sycamore stems into an area that has bright, indirect light and a temperature of 70 degrees F.
Open the covering once a day to refresh the air around the stems. Mist the stems with water to prevent them from drying during root production. Gently pull on the sycamore stems after three weeks of growth to see if there is tension from the root growth. Monitor root length by gently removing the medium around the stems. Transplant the sycamore stems to small growing pots once the roots reach 1 inch long. Grow the sycamore stems indoors for a minimum of one year. Wash all cutting tools and propagation equipment with a cleaning solution of nine parts water mixed with one part bleach. Rinse the items well and let them dry before using.